Why do some schools hold formal recruitment in the fall, while others require that their freshmen wait until spring semester? 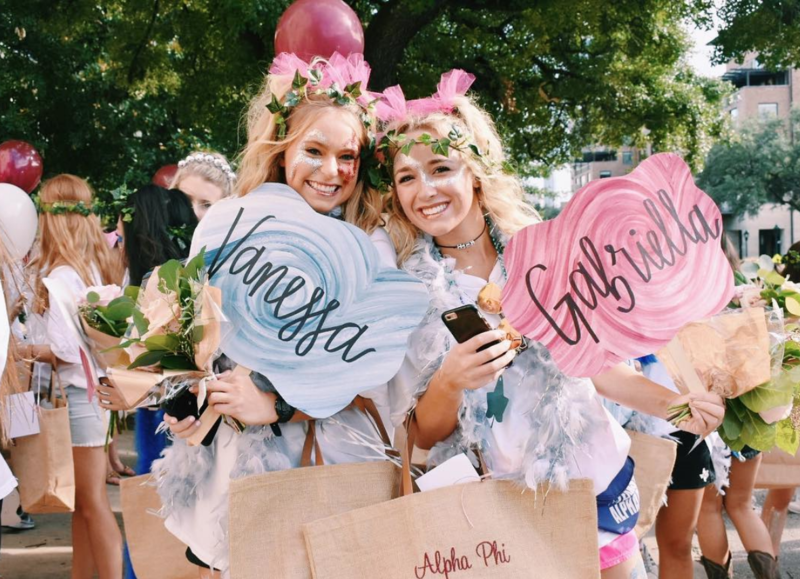 Some PNMs are thrilled to enjoy all the amazing things that come with sisterhood (the friendships, the neon t-shirts, and those little Greek alphabet letters in their Instagram posts) immediately when college begins. Plenty of other incoming freshmen prefer to have the semester to settle in, focus on classes, and to cultivate friendships with a few sororities before they make the four-year commitment. Sometimes it’s tough to find the dates and schedules for your school’s sorority recruitment week if the main Panhellenic sites have old or outdated info. Sometimes you want to keep track of a few schools at a time since you’re unsure which college you’re going to end up selecting. Either way – we’ve compiled a helpful list below so you can spend less time searching. Here you go! Be sure to bookmark this page! Recruitment dates for fall 2019 will be added and updated as the colleges post the information. This list was last updated on 2/11/19. The University of Texas at Austin (UT) – Read our famous post on preparing for sorority recruitment at the University of Texas here. Fall 2019 recruitment dates run from the mandatory Opening Convocation Meeting on August 9th – August 26th (Bid Day). Texas A&M – Recruitment schedule isn’t live yet. Read our A&M sorority recruitment guide in the meantime! Plan to rush? A&M is hosting its annual campus Panhellenic Preview party Saturday, February 9, 2019, from 1:00 pm-4 pm. Sign-up here. Texas Tech – Rush dates for 2019 have been released; Tech’s sorority recruitment will begin with a kick-off meeting on August 18th, followed by recruitment rounds from August 19th-24th. View the full recruitment schedule here. Note: online registration for Tech’s Fall 2019 primary recruitment will open up earlier than most on March 1, 2019. Auburn University – 2019 recruitment dates are posted! Formal recruitment will take place August 10th-16th. See the full recruitment schedule here. Register for recruitment online on or after June 1st, 2019 here. Clemson – Sorority recruitment dates not yet posted. The schedule should go live soon on their Panhellenic website. See last year’s schedule here. College of Charleston – Panhellenic sorority recruitment runs from Wednesday, August 14th, 2019 – Tuesday, August 20th, 2019. A detailed schedule is available here. Dartmouth University – When available, Dartmouth will post fall sorority recruitment dates here. Note: Dartmouth does not allow freshmen to participate in recruitment; PNMs cannot rush until sophomore year. Helpful info here. Florida State University (FSU) – Fall 2019 Sorority recruitment dates are not yet posted. Check back here. Georgetown University – 2019 dates not yet released; info here. Georgetown has two Panhellenic sorority chapters. Kansas State University (KSU) – Sorority recruitment dates for fall to be released shortly. In the meantime, high school students/rushees can sign up for the free spring sorority showcase here on the new site they just launched this spring. Those who attend one of the two recruitment showcases will receive EARLY and discounted access to fall 2019 recruitment registration. How great is that? Louisiana State University (LSU) – Rush schedule TBD. Will link to LSU’s fall 2019 recruitment schedule here when dates have been confirmed. Oklahoma State University – 2019 recruitment schedule is not yet posted. Check back here. San Diego State University (SDSU) – 2019 fall recruitment dates not yet available. More info here. Saint Lawrence University – 2019 sorority rush info not yet available. 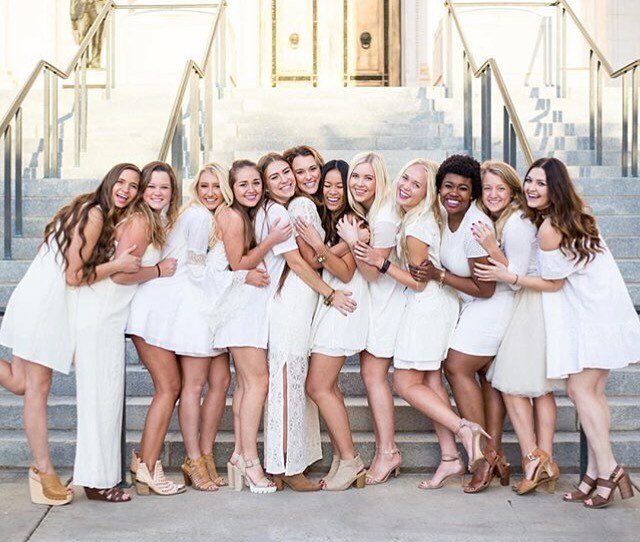 University of Alabama (‘Bama) – Alamaba’s sorority recruitment begins this year on August the 10th and ends with it’s Bid Day on August 18th, 2019. 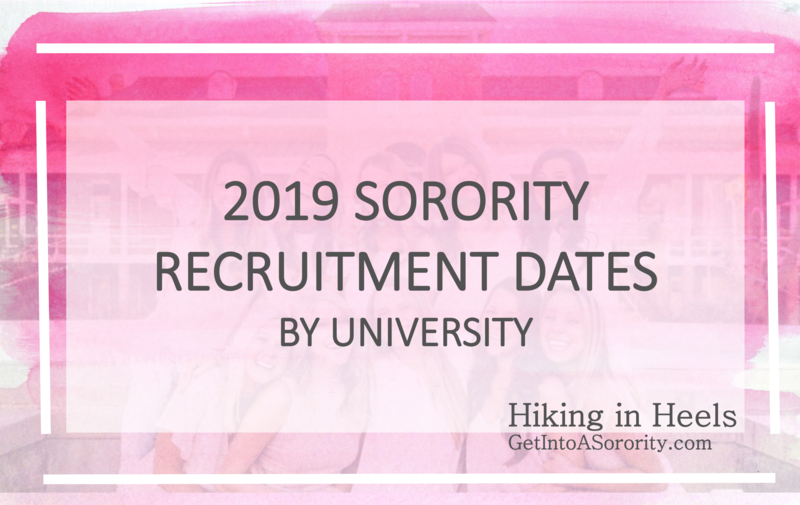 Check out Alabama’s 2019 sorority recruitment schedule + important dates here. Ladies may register for recruitment online on Wednesday, May 1st. University of Arkansas – 2019’s formal sorority recruitment runs from Saturday, August 17 – Friday, August 23. Bid day is Sunday, August 24 at 10 am in the Chi Omega Greek Theater. More info here. University of Arizona – Rush takes place Sunday, August 18th – Thursday, August 22nd. There’s a day of break from recruitment, and then rush continues on Sunday, August 24th-25th. More info here. University of California, Los Angeles (UCLA) – Dates for formal sorority recruitment should be posted soon on their Panhellenic website. University of Georgia (UGA) – 2019 Recruitment orientation takes place Friday, August 9th. Sorority rush goes from Saturday, August 10th – Monday, August 19th, with the exception of a short break for classes August 14th-16th. Early registration begins April 1st-30th. Register for recruitment here. University of Illinois at Urbana Champaign – Dates for 2019 are not yet available. See last year’s schedule here. University of Central Florida (UCF) – Rush schedule TBD for 2019. More info here. University of Mississippi (Ole Miss) – Mandatory PNM orientation and formal sorority recruitment dates for 2019 will be announced later this spring their Panhellenic website. While you’re waiting, read our Ole Miss Sorority Recruitment Guide for some helpful tips! Registration for recruitment opens May 13 and is discounted to $175 if you register before May 31, 2019. University of Missouri (Mizzou) – Rush dates, schedule, and registration links will be posted here. University of Oklahoma (OKC) – Formal recruitment registration opens online Wednesday, May 15th, 2019. Recruitment is Thursday, August 8th – Tuesday, August 13th. Learn more here. University of South Carolina – Fall 2019 recruitment dates will be announced in April, according to this. University of Southern California (USC) – ***THIS HAS CHANGED THIS YEAR. *** USC used to host primary recruitment in the fall, meaning all sororities on campus participated in fall recruitment. “Structured” aka primary recruitment has been moved to SPRING of 2020 this year. Fall recruitment is “unstructured” aka informal this year, meaning not all chapters opt to participate. Learn more about the changes here. Davidson – **Davidson does things a little differently and doesn’t have sororities in the traditional sense, per se. Since they don’t have traditional sorority recruitment, Hiking in Heels does not work with this school, but we’re happy to point you towards some helpful resources. Baylor University – Recruitment begins with a mandatory PNM orientation on Tuesday, January 8, 2019, at 3 PM in Waco Hall. Open House parties begin on Wednesday, January 9, 2019, at 8 am. Cornell University – Recruitment commences on January 15, 2019, with New Member Education from 3:30 PM – 9:00 PM. There are also several required online pre-recruitment trainings. Register for them here. Denison University – Find 2019 recruitment dates and more info on sorority life at Denison here. DePauw University – (Fun fact: Alpha Chi Omega (AXO) and Kappa Alpha Theta (Theta) were both founded here.) Rush kicks off Thursday, January 24th, 2o19 with a recruitment orientation session at 8pm. Formal recruitment begins on January 25th and concludes Sunday, January 27th. Complete recruitment schedule will be posted here. Duke University – Duke’s sorority recruitment begins on January 11, 2019. Emory University – Recruitment week begins January 13, 2019. Furman – 2019 spring sorority recruitment goes from January 10th-13th. Schedule is available here. Georgetown College – Recruitment dates are not yet available. George Washington University – Spring formal recruitment runs from Jan. 17, 2019 – Jan. 23, 2019. Indiana University (Bloomington) – PNMs must attend a mandatory orientation session on Wednesday, January 2, 2019, at 7 pm. Open Invite (aka day 1, round 1 of formal recruitment) takes place January 3rd, 2019. Lehigh University – Spring recruitment dates not yet posted Read up on more recruitment info here. Marquette University – Their Panhellenic organization recommends potential new members follow their Facebook page for updates on pre-recruitment events and recruitment info. First recruitment info session of the semester is October 21st at 6 pm in WHER CHEM 100. Follow it here. Miami University (Oxford, Ohio) – Recruitment begins on January 31, 2019. The deadline to register is January 3, 2019, at 5 pm. Ohio State – A recruitment orientation will be held on Wednesday, January 9th, 2019 in the Archie Griffin Ballroom from 7-8pm. Read more and register for recruitment here. Ohio Wesleyan University – Spring recruitment runs from January 18-20, 2019. Southern Methodist University (SMU) – Click the link to view our SMU sorority recruitment page. Formal recruitment begins on January 14, 2019, and includes several mandatory orientation sessions during the fall. There is also a mandatory meeting the day beforehand on January 13, 2019. Southwestern University – Registration for recruitment 2019 will be open from October 19, 2018, through Wednesday, January 16, 2019, at 5 pm CST. Southwestern posts all it’s recruitment updates and info on pre-recruitment events on it’s Facebook group, Panhellenic Patty more than it updates its Panhellenic website. Stanford University – Deferred sorority rush typically takes place in March/April. 2019 schedule not yet available. FAQ page here. Syracuse University – Get all the recruitment details on spring recruitment here. Tulane University – Rush runs from January 8-13, 2019. University of Dayton – Spring 2019 recruitment period takes place Thursday, January 31, 2019 – Sunday, February 3, 2019. University of Miami – Sororities host primary recruitment during the spring semester. Bookmark this page for recruitment updates. Spring 2019 Recruitment dates are January 8 – 13, 2019. University of Richmond – Sorority recruitment takes place in January. Monitor this link for updates. University of Virginia (UVA) – Read our UVA-specific recruitment tips page here. Formal recruitment begins with a mandatory PNM orientation session on January 7th, 2019. Round Robins begin on January 8th. Register for rush here. Valparaiso – Sorority recruitment runs from January 7 – January 13, 2019. Vanderbilt – Spring 2019 recruitment kicks off with a mandatory pre-recruitment meeting on January 4, 2019. Recruitment rounds begin on January 5, 2019. Villanova University – The Panhellenic Recruitment Kickoff takes place on Thursday, Jan. 25 from 7 PM to 9 PM in Villanova Room. ***Heads up: there are a bunch of pre-recruitment events PNMs are required to attend for recruitment registration eligibility. View the list here under the Panhellenic Council section. Wake Forest University – Sorority recruitment begins with a required Welcome Meeting in Brendle Auditorium on Tuesday, January 8, 2019. Day 1 of recruitment parties begins Wednesday, January 9th. Washington University – Mandatory Meeting for PNMs who registered for formal recruitment is on Sunday, December 9th. Move-in is Tuesday, January 8th by 5 pm. Recruitment begins Wednesday, January 9th and goes through Saturday, January 12th. Unity Day (bid day) is Sunday, January 13th. Register here. Find this article helpful? Visit our Sorority Recruitment Blog for more tips for moms and daughters getting ready for rush! Don’t see your school? Give us a call us at (512) 827-7586 or click here to ask any questions you may have.